Imagine you are taking a vacation. As you drive to the airport, your insurance company is monitoring you: the distance you cover, your speed, how safely you are cornering. Your auto insurance premium will be adjusted accordingly. At the airport a ping from your phone alerts you to an offer of travel insurance, which you buy with a few taps on the screen. Unfortunately when you return home you find that your apartment has been robbed. You submit a claim using the app on your phone and five minutes later you have been reimbursed via your PayPal account. At Global, we launched our “FlightDeck” phone/tablet app in February 2011. It was a first for our sector and it gave general aviation customers the opportunity to generate certificates and file claims from their iPhone. We increased this functionality in 2014 with our “Global on the Move” app which was custom designed for a group of European airport operators. Ultimately, however, we found that end users preferred to use the web portals that accompanied these apps. For the time being, it looks like web portals have the most appeal for our customers. In our sector, apps do have potential to provide something really different. In 2016 we partnered with Verifly to launch their innovative pay-per-use insurance app for drone operators. What is particularly exciting about Verifly is the way it uses geodata and weather data. 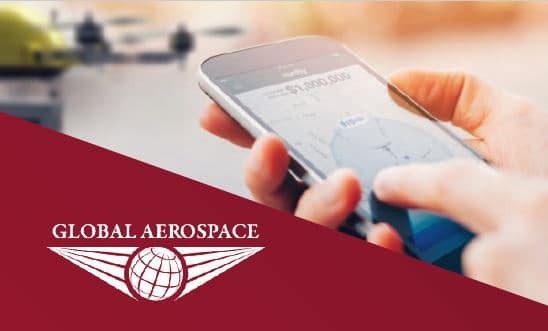 By identifying the exact location of the user’s phone the app can tell if the drone is too close to an airport, for example, or if the wind speed is too high. It therefore alerts the user to potential problems as well as evaluating the precise nature of the risk for underwriting purposes. So where will technology take us next? One trending topic amongst insurance entrepreneurs is “peer-to-peer” insurance whereby customers form teams and pool their claims. Examples include Friendsurance in Germany, auto insurer Hey Guevara in the UK and New York property insurer Lemonade. It’s basically insurance meets social media. These companies all like to style themselves as disrupters, but underneath you will still find a producer and an insurance company. Not so with Teambrella, a Bitcoin-based peer-to-peer platform that aims to take the insurer and the broker out of the equation. Team members will not pay a set premium but will instead deposit funds into a special Bitcoin wallet. The claim process is interesting. Funds from the wallet can only be spent if both the insured member and three out of eight semi-randomly selected teammates sign for it. Could this be the future?